The Mount of Luna, i.e. 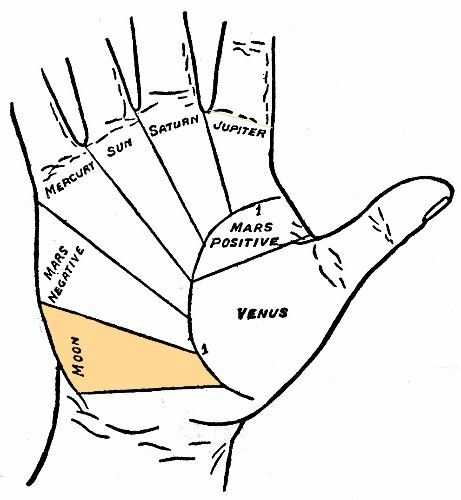 the Mount of Moon is observed at the bottom of your palm under the finishing line of the Head Line. It is related to the artistic or imaginative activities such as romance, creative temperament, poetry, journey, alteration of scenery, etc. The Mount of Moon regarded Positive if it is well improved and high and if you take birth in between 21st June to 20th July and a little bit until 27th. If you belong to this Mount then you are gifted with powerful thoughts which touch anything you say or do. You are very deeply romantic though you are idealistic in your wish. You do not possess that kind of sensual or passionate characteristic which is provided by Mount of Venus on the reverse side of your hand. As per norm, you possess the creative features well improved. You get success in your invention and in the new ideas whatever profession you may select. If you related to business then you may be significant for your innovation and the creative way in which you may undertake the most realistic affair. However, you have the tendency to gamble or speculate with your opportunities along with stocks, trades or anything in which you are involved. You possess a great imagination power. 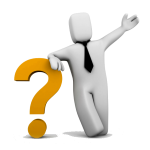 Hence, you often obtain immense success and earn money in business. Few well known investors and chief or reputed organisations have been taken their birth in due course. They may also possess the Mount of Moon or Mount of Luna very highly improved on their palms. It is said that if you watch any dream then it may definitely happen in reality. But the actuality is artistic persons have been noticed among the most victorious of all. Creative or imaginative power possibly may be another name of motivation. If you take birth at this period then you are hardly stubbornly prejudiced by any norm of thumb or set principle. You love any new thing. Hence, you love journey or change. Normally, you visit a greater portion of the earth before your death. Changes in every step may affect your career and your life too. Actually, if you are one of the most successful people then you may face many ups and down in your life than the other people. You hardly yield to the blows of Destiny or Fate. Your imagination may assist you through and you hardly stay down or depressed for long time. The Mount of Moon normally observed on the palm of inventors, musicians, a huge number of artists and composers. But you possess an inclination towards the occult and mystic things. Your visions and dreams are clear and tangible. You are obliged much to the power of the earth that you are much more successful and magnetic at that time when the Moon comes to the heavens. 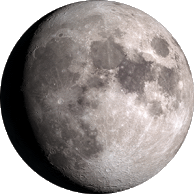 Your health may change and you feel better under the benevolent influence of Moon. Hence, you have to start your plans or activities when the Moon is being seen enlightening the sky. None may doubt about the fact that the Moon has a great influence in the earth. Recently it is found that Moon’s extraordinary magnetic power possess an influence more or less beyond the faith in Moon’s effect upon the expansion of inanimate thing and vegetable. If Moon is affecting the eggs, vegetable and the enlargement of chickens then it is thinkable its effect on the matter of the brain of a human being that is much more mysterious and subtle fundamental nature to all. If you take birth in this period then you have to stay alert of the people who are associated with you as you are excessive sensitive to the appeal of other people. If possible, you must keep away from marriage in the early days of your life if not you are totally sure you have met your resemblance. This kind of nature rapidly develops and changes. You possess a powerful inclination towards raise away from the people who are associated with you in the early life. It is similar to your business partner. You must rely on yourself. If you make a partnership then you must not be of a restricting or binding order. You must make a provision for partnership to be suspended if it turns into irritating one. You may mainly suffer from inflammatory disease and watery ailments. In your early days, you have a possibility that you may suffer from possessing water in your brain. You may suffer from dysentery or gastric problems. In the later part of the life there is a chance that you may suffer from the inflammation of chest and lung, dropsy and pleurisy. If the Mount of Moon is too much flat on your palm and you take birth in between 21st January to 20th February a little bit until the 27th of February then this Mount is regarded Negative or Mental. If you take birth in due course then it is obvious that you may possess a very strong mental power. But your creative nature is hardly found as much in the case as of Positive Mount. You are good and ratiocinators out of difficulties and the subject connecting to the business organisation. You are superb in any sort of governmental job. You possess super head of department. You can rise to any task very sharply and smoothly. Your mind is very high. You possess very decided opinions on responsibility, social life and love. You try your best for the well being of other people. But as per norm, you are much more successful if you help to the masses than the individual. You are excessive caring and you love to provide the helping hand if it is possible. There is a possibility that you make some foes at that time too. If you hold any post to the government then there is a big possibility to face opposition from others. You hardly obtain the proper recognition of your work and reward if you do not go through the speciality of influence or leave the world with ingratitude and mistrust. You are normally a good orator. You are famous for your straight forward speaking in your own way. According to the norm, you take up the not accepted cause and take part as an underdog in a battle. If you friendship is aroused then you make loyal and devoted pals. But the interesting fact is that you are excessively emotional and easily hurt by those whom you care for. You are very much inclined to the spiritualism. Normally, you bring your spiritual views into your all kinds of activities. It is dangerous when you become too much fervent. If you are opposed then you are excessively rigid, stubborn and tough to manage. You like to work in huge responsible work, particularly the work of any governmental task or in the management post. Normally, you are worried too much about your bad health. You work too hard and induce weakness in heart, palpitation and nervous breakdown. There is a possibility that you may suffer from paralysis. You may suffer from problems of stomach, rheumatism, liver, blood and gout. There is a possibility that you may meet with accident to the limbs, ankles or feet. You must be very much protected at the time of travelling through water. There is a possibility that you may lose your life by drowning.